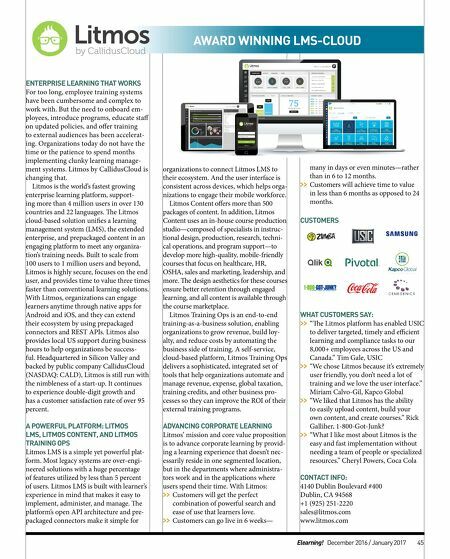 44 December 2016 / January 2017 Elearning! 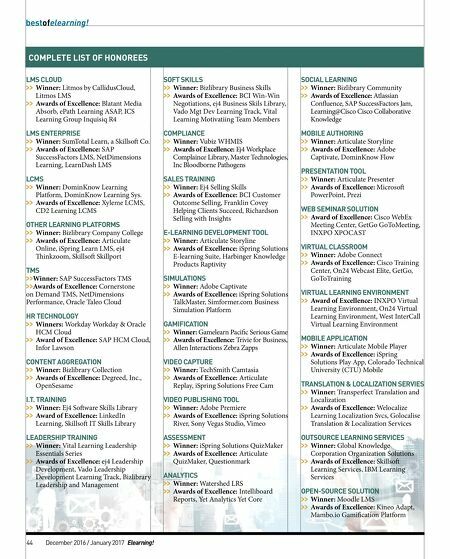 COMPLETE LIST OF HONOREES LMS CLOUD >> Winner: Litmos by CallidusCloud, Litmos LMS >> Awards of Excellence: Blatant Media Absorb, ePath Learning ASAP, ICS Learning Group Inquisiq R4 LMS ENTERPRISE >> Winner: SumTotal Learn, a Skillso Co. >> Awards of Excellence: SAP SuccessFactors LMS, NetDimensions Learning, LearnDash LMS LCMS >> Winner: DominKnow Learning Platform, DominKnow Learning Sys. >> Awards of Excellence: Xyleme LCMS, CD2 Learning LCMS OTHER LEARNING PLATFORMS >> Winner: Bizlibrary Company College >> Awards of Excellence: Articulate Online, iSpring Learn LMS, ej4 inkzoom, Skillso SkillPort TMS >> Winner: SAP SuccessFactors TMS >> Awards of Excellence: Cornerstone on Demand TMS, NetDimensions Performance, Oracle Taleo Cloud HR TECHNOLOGY >> Winners: Workday Workday & Oracle HCM Cloud >> Award of Excellence: SAP HCM Cloud, Infor Lawson CONTENT AGGREGATION >> Winner: Bizlibrary Collection >> Awards of Excellence: Degreed, Inc., OpenSesame I.T. TRAINING >> Winner: Ej4 Soware Skills Library >> Award of Excellence: LinkedIn Learning, Skillso IT Skills Library LEADERSHIP TRAINING >> Winner: Vital Learning Leadership Essentials Series >> Awards of Excellence: ej4 Leadership Development, Vado Leadership Development Learning Track, Bizlibrary Leadership and Management SOFT SKILLS >> Winner: Bizlibrary Business Skills >> Awards of Excellence: BCI Win-Win Negotiations, ej4 Business Skils Library, Vado Mgt Dev Learning Track, Vital Learning Motivatiing Team Members COMPLIANCE >> Winner: Vubiz WHMIS >> Awards of Excellence: Ej4 Workplace Complaince Library, Master Technologies, Inc Bloodborne Pathogens SALES TRAINING >> Winner: Ej4 Selling Skills >> Awards of Excellence: BCI Customer Outcome Selling, Franklin Covey Helping Clients Succeed, Richardson Selling with Insights E-LEARNING DEVELOPMENT TOOL >> Winner: Articulate Storyline >> Awards of Excellence: iSpring Solutions E-learning Suite, Harbinger Knowledge Products Raptivity SIMULATIONS >> Winner: Adobe Captivate >> Awards of Excellence: iSpring Solutions TalkMaster, Simformer.com Business Simulation Platform GAMIFICATION >> Winner: Gamelearn Pacific Serious Game >> Awards of Excellence: Trivie for Business, Allen Interactions Zebra Zapps VIDEO CAPTURE >> Winner: TechSmith Camtasia >> Awards of Excellence: Articulate Replay, iSpring Solutions Free Cam VIDEO PUBLISHING TOOL >> Winner: Adobe Premiere >> Awards of Excellence: iSpring Solutions River, Sony Vegas Studio, Vimeo ASSESSMENT >> Winner: iSpring Solutions QuizMaker >> Awards of Excellence: Articulate QuizMaker, Questionmark ANALYTICS >> Winner: Watershed LRS >> Awards of Excellence: Intelliboard Reports, Yet Analytics Yet Core SOCIAL LEARNING >> Winner: Bizlibrary Community >> Awards of Excellence: Atlassian Confluence, SAP SuccessFactors Jam, Learning@Cisco Cisco Collaborative Knowledge MOBILE AUTHORING >> Winner: Articulate Storyline >> Awards of Excellence: Adobe Captivate, DominKnow Flow PRESENTATION TOOL >> Winner: Articulate Presenter >> Awards of Excellence: Microso PowerPoint, Prezi WEB SEMINAR SOLUTION >> Award of Excellence: Cisco WebEx Meeting Center, GetGo GoToMeeting, INXPO XPOCAST VIRTUAL CLASSROOM >> Winner: Adobe Connect >> Awards of Excellence: Cisco Training Center, On24 Webcast Elite, GetGo, GoToTraining VIRTUAL LEARNING ENVIRONMENT >> Award of Excellence: INXPO Virtual Learning Environment, On24 Virtual Learning Environment, West InterCall Virtual Learning Environment MOBILE APPLICATION >> Winner: Articulate Mobile Player >> Awards of Excellence: iSpring Solutions Play App, Colorado Technical University (CTU) Mobile TRANSLATION & LOCALIZATION SERVIES >> Winner: Transperfect Translation and Localization >> Awards of Excellence: Welocalize Learning Localization Svcs, Golocalise Translation & Localization Services OUTSOURCE LEARNING SERVICES >> Winner: Global Knowledge Corporation Organization Solutions >> Awards of Excellence: Skillso Learning Services, IBM Learning Services OPEN-SOURCE SOLUTION >> Winner: Moodle LMS >> Awards of Excellence: Kineo Adapt, Mambo.io Gamification Platform best of elearning!